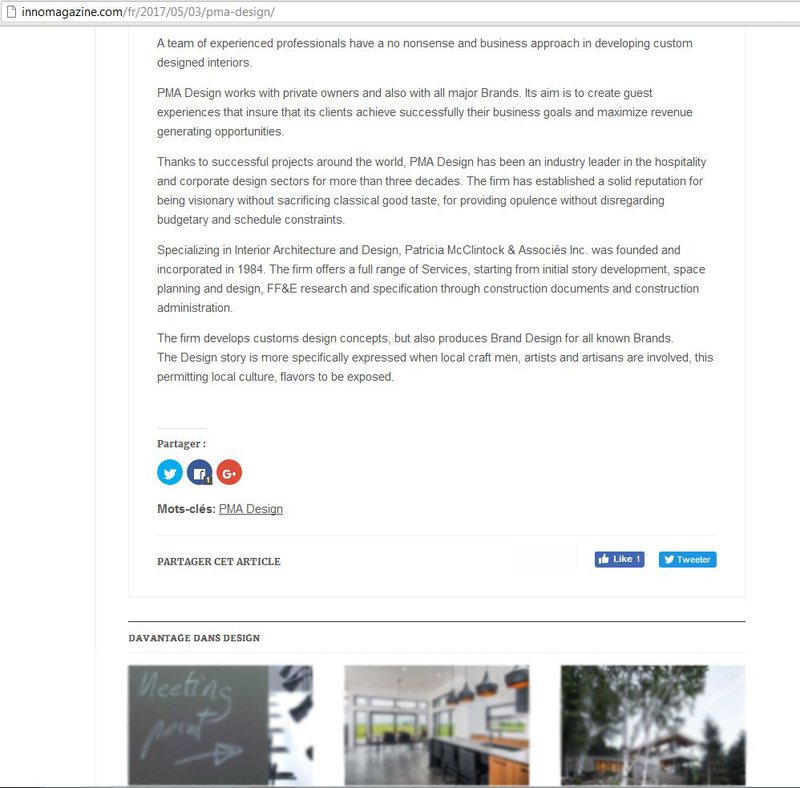 Also known as PMA Design, the firm is a multidisciplinary team of designers, specifier, architectural technicians and story tellers. Unexpected and functional hospitality experiences are created and inspired from the team diverse backgrounds such as Interior Architecture and Design, business, internationalism and fine Arts. These experiences bring pleasure to guests and their families while providing our clients with great results. 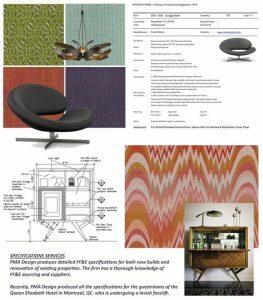 For over 30 years, Patricia McClintock & Associés inc. has strived in creating both visually superb interior environments and spatially sound, that incorporates local culture thru art and color. The Design intent is to produce harmonious environments offering guests the opportunity to come into contact with aesthetics, sophistication and the possibility of engaging and experiencing unexpected pleasurable guest experiences. 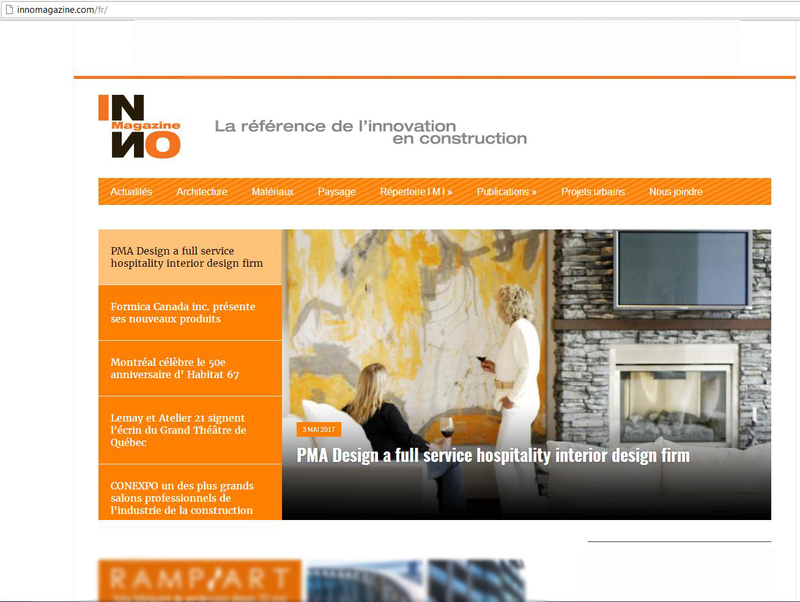 A team of experienced professionals in developing custom designed interiors. 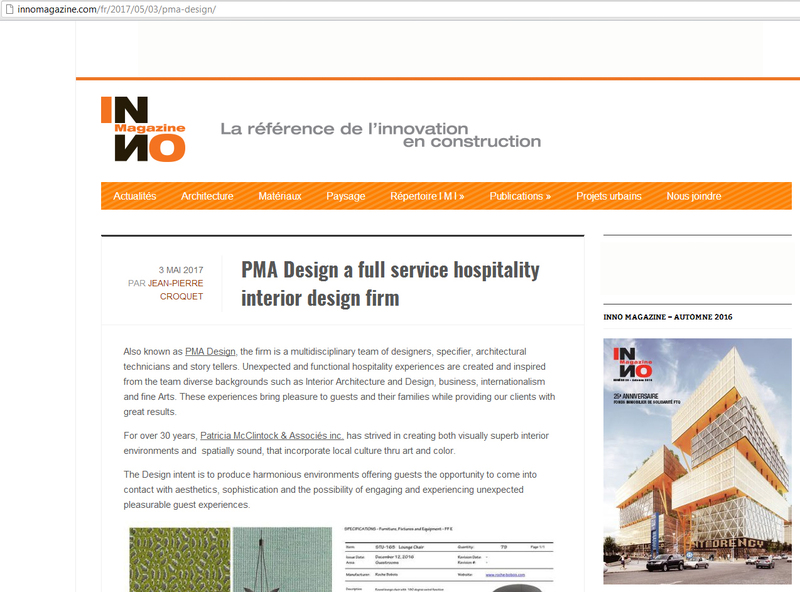 PMA Design works with private owners and also with all major Brands. Its aim is to create guest experiences that insure that its clients achieve successfully their business goals and maximize revenue generating opportunities. Thanks to successful projects around the world, PMA Design has been an industry leader in the hospitality and corporate design sectors for more than three decades. The firm has established a solid reputation for being visionary without sacrificing classical good taste, for providing opulence without disregarding budgetary and schedule constraints. Specializing in Interior Architecture and Design, Patricia McClintock & Associés Inc. was founded and incorporated in 1984. The firm offers a full range of Services, starting from initial story development, space planning and design, FF&E research and specification through construction documents and construction administration. The firm develops customs design concepts, but also produces Brand Design for all known Brands. The Design story is more specifically expressed when local craft men, artists and artisans are involved, this permitting local culture, and flavors to be exposed.